Thankfully, Hurricane Gustav weakened Sunday night, hitting southwestern Louisiana as a category 2 hurricane. The levees held and New Orleans dodged another bullet. Good. I got a call from my friend Rhonda yesterday morning. She and her family had returned to their home in Slidell the night before and were happy to discover no damage. Her feelings about the way things were handled for Gustav? After seeing the post-Katrina clip montage I posted last Sunday- specifically a clip that I cut away from after panning to a street sign for geographical reference- Tyler Slack got curious and did a little investigating with the help of Google Street View. In that clip I filmed a location on Forstall Street in Lower Ninth Ward. The clip showed the stairs of a front porch, the only remains of a house just blocks away from one of the breached levees, which had been completely washed away. 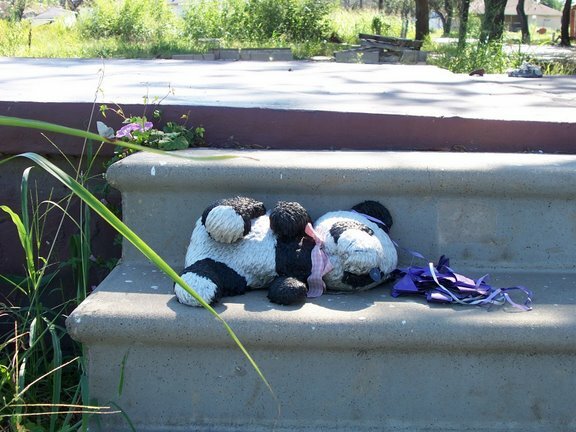 On the steps to nowhere was a small stuffed panda bear. Tyler dropped me a note early this morning with a link to the latest Google Street View images of that same house. According to Street View’s last pass- which looks recent- the panda bear still lies on that porch, though now a couple steps down from where it was when I filmed it. While it’s sad to see that little has changed (as far as rebuilding) at that location, I was happy to see that little panda bear. Rewind to that September day in 2006. My wife had dropped me off in the Lower Nine, which was still completely deserted. Nothing but the occasional salvage vehicle and National Guard humvees. Aside from the almost overwhelming cicada screech (which oddly wasn’t really picked up by my camera’s mic) the entire neighborhood was completely silent. I walked down Jourdan, Deslonde, and Tennessee (none of which were identifiable), then Forstall, where I spotted that wagon and the teddy bear. The site epitomized the overall feeling, which was indescribable: heavy, ghostly sorrow mixed with awe of nature’s power. As I mentioned in my first post-Katrina article, the floodwaters had receded a year prior, but it might as well have been yesterday. I’ve often thought about that teddy bear- whose it was- how it lays there, mildewed and abandoned in the quiet. I wonder if where that child whose teddy bear it was is now- if he or she remembers that bear. I’ve always kinda hoped the child- now three years older- would someday return to find it. There was no way I could identify which house that was. Google shows the approximated address as 2112 Forstall, but tracking down the owner would be quite a task. I left the bear where it was. Thankfully, so has everybody else. If you happen to be wandering down Forstall Street in New Orleans’ Lower Ninth Ward, please do me a favor- let that panda be. between New Orleans and the Florida panhandle. THE LAST THING WE HAD TO EAT WAS POPEYE’S FRIED CHICKEN in Slidell. We had vowed to limit our meals to food we couldn’t find back home. Yes, Popeye’s is fast food, but it’s gourmet fast food in my book. In Utah we have Kentucky Fried Chicken, but KFC doesn’t hold a candle to Popeye’s juicy goodness. We bought some extra biscuits for the road, but they were rock-hard by the time Neil Benson dropped us off at our car after our swamp adventure. The next closest towns were Waveland and Bay St. Louis, and we headed eastward on the quest to fill our bellies with authentic southern cuisine. We stopped at a little place called Catfish One at the edge of Waveland. I’m not a catfish nut, but the very thought of the platter I ordered makes my mouth water to this day. This small fish stand is run out of a trailer several yards from a crumbling foundation, presumably the former home of its owners. The owners now live in a smaller trailer that sits behind the ramshackle stand. There were no standing homes in the area that I could see, only makeshift trailer parks filled with row after row of white FEMA trailers. A year after the storm, residents were making the best of trailer life by planting little gardens and manicuring small unofficial yards. Hurricane Katrina made her final land fall at the mouth of the Pearl River near Bay St. Louis. And although the town is the highest point along the entire Gulf Coast (12 feet above sea level), much of it was swept away by a 30 foot storm tide. The lonely highway approaching St. Louis Bay is lined with downed timber, huge piles of debris, and gutted buildings. The lack of signage or visible landmarks rendered our map useless. We stopped to ask a gas station attendant if we were close to Bay St. Louis. “You are in Bay St. Louis,” he replied. We never made it to Pass Christian, a small historic town across St. Louis Bay. Of Pass Christian’s 8,000 homes, all but 500 were decimated by Katrina. We had hoped to drive across St. Louis Bay on the U.S. 90 bridge, and on to Biloxi, but the bridge was destroyed and had not yet been rebuilt. We had to backtrack to I-10 to head further east. We made our way back down to the coast at Gulfport, a fishing town in a lot better shape than Bay St. Louis where we bought some sand dollars and a bottled dead shark. We then continued along the coast to Biloxi where we hoped to stay the night. In the West we drink “pop.” Northeasterners sip “soda.” Bostonians order “tonic.” In the South they just drink Coke- Dr. Pepper Coke, Pepsi Coke, Shasta Coke, Sam’s Choice Coke, even regular Coke Coke. Thankfully there are still different cultural dialects to add spice to an increasingly homogenized nation. Food names aren’t the only differing designations for things. Geographical perception differs from region to region as well. In the West we think we have rivers. In reality, Western rivers are more like large streams. Easterners laugh at our “rivers.” That’s ok, because we laugh at their “mountains.” Northern lakes tend to be small to moderate sized bodies of freshwater . Deep South folk probably see northern lakes as over sized puddles, while I see their lakes as small seas or large bays. In fact, I’m not quite sure how most lakes in the Deep South actually fit the definition. The least sea-like lake in the Deep South is most similar to Utah’s most sea-like lake. Lake Pontchartrain is the second largest saltwater lake in the United States, after our Great Salt Lake. But where Utah’s inland sea has no outlet, Lake Pontchartrain drains into Lake Borgne, which drains into the Gulf of Mexico- which, going by the Deep South’s geographical definitions, could arguably be called a really big lake. You could mistake it for a lake, too. Much of the Gulf Coast is lined with a chain of barrier islands- long, linear landforms that are technically large sandbars. These islands serve as the mainland’s primary protection from storms. They also break strong waves, which is why there are no Beach Boys songs about surfing Pascagoula. The coastal waters here are calm and the beaches short. Biloxi looked a lot better than it did in pictures right after the storm, but it still easily qualified as a class B/C/D hybrid ghost town (rubble and/or roofless building ruins, standing abandoned buildings , and a small resident population). There was a small carnival in the center of the city, but elsewhere people were nowhere to be seen. It was getting dark, and we passed many abandoned resorts and hotels as we looked for somewhere to stay. Since the storm, many new properties have sprung up between the abandoned ones- the new and modern juxtaposed with the old and deteriorating. Handsome new buildings with empty parking lots stood waiting for somebody- anybody to stop in and spend the night. We prepared for our usual small town motel routine: I stay in the car while my wife goes in (she’s much more persuasive than I am, not to mention better looking) and drives a hard bargain. Once they’re convinced your really going to walk out of their lobbies and look elsewhere, most roadside motels will make you the offer you were looking for. This method has worked for us from coast to coast for many years. So how much were they be willing to knock off the price for lack of these essentials? Nothing. Suddenly the Garden Center at Wal-Mart didn’t sound half bad. Somewhere between Biloxi and Pascagoula I reluctantly had to stop for a Red Bull. Normally I don’t drop $2.50 for a small can of something that tastes like brake fluid, but I hadn’t slept since Salt Lake and it was either that or fall asleep at the wheel. I gagged it down and we continued eastward along the quiet coast. We were hoping the motel entrepreneurs in Pascagoula would be more reasonable than their Biloxi counterparts. Thankfully they were, and we were soon sleeping soundly at the Best Western. I’ve always dreamed of walking along an endless white sand beach dotted with palm trees, crystal clear waves lapping against it- the kind of beach you see on desktop wallpapers and in frames hanging on the walls of travel agencies. The Great Salt Lake is ok to look at, but no way am I taking off my shoes on those alkali shores, and no way would I ever dive in. The Pacific ocean is the closest to home, but the water is cold and murky, and if you go in after a rainstorm, you might just come out with a few extra bacteria in your system thanks to Mexico’s pipe-free sewer system. That’s why I was so excited to finally reach Pensacola, the first European settlement in what would be come the U.S., and home to the whitest beaches I’ve ever seen pictures of. We would only have one day there, so we woke up early and got on the road. It was about time we checked some email and payed a few bills, so we drove to the Krystal, a hamburger chain whose claims to fame are its Krystal burgers and its free wireless Internet access. After sitting for a while in the parking lot, I figured I better go in and at least buy something to repay the good owners for letting us jump on the net for free. I wanted a breakfast combo and I wanted to try the Krystal, a mini hamburger served in bulk quantities. Not wanting a sack full of hamburgers with my grits, I made the mistake of asking if it was possible to buy just one. “A single Krystal?” the lady asked, causing the other cashier and the cook to glance at me in total confusion, the same way the servers at Mexican restaurants look at me when I ask for no lettuce on my combo plate. Finally a managerial-looking woman walked up from the back with a single Krystal all wrapped up special for me. I was too flustered to remember the breakfast combo, and I can’t imagine the laugh they had at my expense when I walked out of there. Moral of the story: If you want to liven up your trip to Mississippi, walk into a Krystal and order just one. My single Krystal down the gullet, we drove straight through Alabama and over the Florida border to Santa Rosa Island, a 40 mile barrier island off of Pensacola Bay. I spent so much time looking at that island on Google Earth that I could have driven there with my eyes closed. My wife hates the ocean. Hates it. She’s scared to death of it. Probably from watching Shark Week on the Discovery Channel. She has no desire to set foot on a beach, let alone swim in the ocean. She was perfectly content to drop Coulter and I off at one end of the island and drive back to explore the city. I strapped the boy onto my back and made a beeline to the water. It was clear that the beaches had been damaged by Katrina, which washed some sand away and increased the beach’s slope. But it was nice nonetheless. The sand was a brilliant white and it crunched under my feet. The water was warm- somewhere between the temperature of a heated pool and a hot tub. And it was crystal clear. The geography of the Gulf Coast changes significantly between southern Louisiana and the Florida panhandle. At the waterline, beaches in the panhandle gradually slope for about 20 yards before suddenly dropping off to depths of up to 200 feet. The drop is very visible on the surface, where a turquoise morphs abruptly into a deep blue. Since the water is so clear, you know exactly when you swim past the drop off. This is where swimming off the California Coast has it’s advantages. You have no idea how deep the water is or what creatures may be swimming beneath you. Here various sharks and rays were clearly visible from the surface, so Coulter and I stayed shallow. We strolled for miles along the beach, watching dolphins, playing in the sand and picking up shells along the way until we reached the pier, where we watched the sunset. It was then that I realized just what good buddies Coulter and I were. And while I initially had reservations about bringing him on this trip, I wouldn’t have traded this day with him for the world. Bonneville Mariner visited the Gulf Coast in September, 2006. Continuing with his Gulf Coast series, the author recounts a visit to the Honey Island Swamp along the Pearl River. FOR ME, EXPLORATION HAS ALWAYS BEGUN AT CIVILIZATION’S END. In most places, one must retreat from the neon signs and golden arches and fully exit the concrete jungle to find wilderness. Generally, if I have even one bar of reception on my cell phone, I haven’t wandered far enough. Most populated places in America attempt to integrate wilderness into civilization in the form of “green spaces” – finely manicured plots of lawn and picnic benches that are supposed to convey a sense of nature and openness. In the Deep South, it’s the other way around. Here, small towns carve a sense of civilization into immense, untamed wilds. Even larger suburbs seem strained to keep a creeping wilderness at bay. Slidell is a New Orleans suburb that lies under a canopy of loblolly pine on the northeast shore of Lake Pontchartrain. It’s an area saturated with rivers and bayous, where small gravel roads lead to stilted home neighborhoods deep in the marshes where you wouldn’t think neighborhoods would or could be. It’s a lowland so low (3 feet, to be exact) that the term “terra firma” doesn’t really apply. And unlike most places in the country, here one can simultaneously be deep in the wilderness and a stone’s throw from a Waffle House. Slidell is bordered to the east by the West Pearl River, which flows from it’s headwaters in the area of the Nanih Waiya Indian Mounds in central Mississippi and drains into the Rigolets and eventually into the Gulf of Mexico. The Pearl is home to the Honey Island Swamp, one of the most beautiful and least-altered river swamps in the United States. It takes it’s name from tales of abundant wild honey made by renegade bees that had escaped their beekeepers. We had made no hotel reservations. There was nothing on the itinerary. We had no plan other than to drive lonely roads and explore forgotten corners of this subtropical wonderland. We drove slowly along Hwy 190, trying to take everything in. I soon saw that tombs weren’t the only objects stolen away by Katrina’s flood waters. A large tugboat loomed just off the highway, miles from any open water. I got out to take some pictures and was instantly attacked by swarms of what looked like over-sized flying ants. These little monsters came in mating pairs, and I was amazed that they would take the time out of their procreative rite to sink their teeth (or fangs, or pokers, or whatever) into my forearms. My only option was to run until I got close enough to snap a couple pictures, then sprint back to the car. It’s amazing how fast an out-of-shape thirty-year-old can run when being chased by hordes of two-headed devil bugs. So enjoy these pictures of the runaway tugboat- I paid dearly to get them. A few miles and several more beached boats later, we pulled into a clamshell lot fronting a swamp museum on the banks of the Pearl. A wooden walkway led out to the bank where we met two swamp tour captains, both with heavy Cajun accents. It was early afternoon and both captains had ended their tours for the day. The swamp tour business was good before Katrina, they told me. Honey Island Swamp guides are now lucky to have one full boat per day, and it would have been a waste of gas and time to take only us on an after-hours tour. As we were turning to walk back to our car, another tour boat floated by and offered to take us aboard. Ah, the swamp. Something I’ve seen in many a movie but never experienced for myself. It was amazingly quiet for an area so rich with wildlife. The setting was right out of the boat launch scene on the Pirates of the Caribbean ride at Disneyland- except that particular ride scene was probably taken straight from here. Old ramshackle boathouses lined the bank across from the launch, and I half expected to pass a fisherman strumming ‘O Susanna’ on his banjo before plunging down a waterfall into the world of swashbuckling pirates. But this was the real deal. It was obvious that Katrina had been here. Lines of boathouses floated abandoned along the shore. Across from the launch one medium-sized boathouse rested atop a much smaller outhouse. A smaller boathouse floated beside the first, seemingly untouched by the storm. “I’m going to turn on a little AC,” said Captain Neil Benson, owner of Pearl River Eco-tours. “Oh good,” I thought. “I’m dying out here!” Turns out he just meant he was going to drive the boat really fast. It did feel good though. After speeding along the main waterway for a mile or so, Captain Neil stopped to turn into a narrow channel leading into a slough he called Dead River. A slough is a shallow backwater lake system that parallels the main bayou waterway. The Honey Island Swamp is a 70,000 acre maze of these sloughs. This caught my interest. I asked him later to elaborate. Neil killed the engine as the slough opened into an oxbow lake or billabong, created when a wide meander of the river is cut off. I noticed a small green tree frog perched on the handrail next to my elbow. Though the swamp is densely populated with wildlife, it takes a trained eye to actually spot most of it. Once I saw that frog, I began noticing them everywhere. The swamp is like a 3-D Where’s Waldo book. The best way spot wildlife is to think of one type of animal and scan the banks until you see it. We don’t have a lot of critters in Utah. I sleep on forest floors and dive into lakes and rivers without a second thought. My Texas-bred wife nearly went into cardiac arrest the first time she saw me wade out into the Provo River for a swim. In Utah there is a notable lack of animals that can hurt/maim/kill you compared to the Deep South. The most dangerous creature to hikers in Utah is the rattlesnake- and even he will give you fair warning before striking. Well, I guess if it’s only an occasional bull shark mixed in with the alligators and snakes. I feel so reassured! Somewhat of a political anomaly, Neil is a serious environmentalist who drives a pickup with an NRA bumper sticker. His love for exploration and adventure evolved into a passion for this delicate ecosystem, and he’s been guiding swamp tours for over a decade. A few days after hurricane Katrina nearly stripped life from the swamp by ripping off its canopy and flooding it with salt water, Neil ventured out to inspect the damage with reporter Ben Montgomery of the Tampa Tribune. “It was my first time back in the swamp after the storm,” Neil tells me over the phone two years later on the second anniversary of Katrina’s landfall. “It was heart breaking. I’m not an emotional person, but I have to tell you I was in tears.” A couple hours on a boat with Captain Neil reveals his zeal for this place. Back in open water, we saw our first gator. Once we spotted one, we started seeing them everywhere. As we passed, alligators would swim toward the boat angling for the marshmallows Neil would toss to them. He even reached out to pet the one he calls Big Al. We did not witness this mythical creature that day. But then again maybe we were only taken to the “tourist-friendly” areas of the swamp where the beast is less likely to skulk. Looking at a satellite image of the swamp I’m amazed at how little of it we saw. Next time I’m down that way I plan to convince Neil to introduce me to the more secreted grottoes of this mysterious and wonderful place. Neil tells me he does take people out on extended private excursions, but he requires customers to sign a “sign your life away” waiver. All photos by Bonneville Mariner. Article content exclusively owned by article author Clint Thomsen (Bonneville Mariner). A word about tours in the Honey Island Swamp- I’ve spoken with people from most of the other swamp tour companies on the West Pearl River and I’ve found Neil Benson to be the friendliest and most knowledgeable among them. The rest of the companies wanted nothing to do with me once they found out I was calling from Utah and not calling to reserve a ticket. Neil has spent a lot of time answering my dumb questions and helping this desert rat understand the humid subtropical ecosystem and its environs. If you visit New Orleans, your trip will be incomplete without a swamp tour. When you make your plans, please give Neil a call (866-59-SWAMP). down or click here for part 1, here for part 2. I FOLLOWED THE NEWS CLOSELY WHEN NEW ORLEANS FLOODED, but was still relatively clueless when we arrived. I expected to walk off the jetway into a flood-ravaged terminal with visible water lines on the walls. I was anxious to see what this place was really like. Getting there, however, was no short trip. Our flight was set to leave Salt Lake City early in the morning, getting us into New Orleans early in the afternoon after a short layover in Denver. We planned on picking up a rental car and spending the evening in New Orleans before making our way to Pensacola. But a ten-minute delay on the tarmac in Salt Lake made us miss our Denver connection and the next available flight into New Orleans was much later in the evening. It was 9 AM in Denver and we were already frazzled. 10 hours later we walked up a jetway into a nearly empty Louis Armstrong International Airport. A lonely jazz tune piped through its vacant terminals, echoing off the bare walls. This airport looks straight out of the 1980’s. The seats, the TV’s, the cigarette smoke-saturated carpet- I could have sworn I was walking through the set of the 1980 movie “Airplane.” Not that I minded. I used to spend hours as a kid running through Salt Lake City International back in the days when, if you were nice enough to the gate agent, she’d let you tour the plane and give you a pair of pin-on wings. I miss those days, and Armstrong International’s retro look reminded me of simpler times. My first meeting with a true New Orleanian set the tone for the rest of our trip. With all the flight changes our luggage had not yet arrived, so we waited our turn at the customer service desk, where we greeted by a burly man in a white t-shirt waiting in line in front of us. Talking to him was like talking to an old buddy and we shot the breeze for a good while. He was a luggage courier who was waiting for his next run. He seemed to take an interest in the baby on my back. “My wife just had a baby,” he said in a noticeably sad tone that made me hesitant to ask about it. I didn’t have to. He opened up to us like an old friend and explained that their baby had died shortly after her birth, cause unknown. That was two days before. Suddenly my flight woes didn’t seem so bad, and even after a frustrating day, I didn’t mind waiting in that line. In the months prior to our trip I read everything I could find about driving the Gulf Coast. Of all the pieces on Katrina I read, one BBC article caught my eye. It was an account written by freelance writer Rhonda Buie from Slidell, a town just east of New Orleans across Lake Pontchartrain. Ms. Buie recounts her first trip back to the Slidell area post-Katrina through a combination of prose and video clips. What struck me most was that it was different than the New Orleans stories. With Katrina coverage decidedly concentrated on flooded New Orleans, those of us who relied on cable news and the national press hardly knew the rest of the Gulf Coast existed. Buie’s narration of her drive through a region less-known to us westerners really resonated with me. I contacted Ms. Buie and asked her to give me some tips on visiting the area. We talked for a long time about the South and Katrina, and by the time our conversation ended I had made a good friend. Rhonda’s parents’ home was badly damaged by the hurricane and they had spent the entire year rebuilding. I re-watched her video clips to prepare myself for the trip. This chimney is all that remains of this Slidell home. She didn’t seem to take offense, but I was embarrassed, which only made me more cantankerous. See, United had promised to deliver our luggage within a few hours after our arrival in New Orleans, but I spent the entire night waiting for them to deliver it. No fresh clothes, no toothbrush, no deodorant, no bottle for the restless baby. The motel didn’t provide soap (the lobby did sell various soaps labeled with the names of other nearby hotels). The baby eventually fell asleep and I walked over to the lobby so my wife could rest as well. I’ve never seen so many Halloween decorations in my life. The place was adorned with every cheesy dollar store decoration one can imagine. Somebody at this fine establishment was a very big fan of Halloween. A stack of job applications laid next to a help wanted sign, and I took the opportunity to fill one out for my brother, because that’s what brothers are for. Still feeling stupid from my earlier goof, I tried to redeem myself with the night clerk by chatting with her between rage-filled phone calls to United’s staff in New Delhi. She would be getting off at 5:00, but she offered to wait around for our luggage because another clerk wouldn’t be in until later that morning. When our luggage finally arrived at 10 am, we drove right through New Orleans and headed toward Slidell. Honestly, I made no memorable observation between Kenner and Slidell. I did get a phone call from United, though. Somehow my complaints made their way back to the States. They gave me a $25 gift certificate for my troubles. How thoughtful of them. Once in Slidell, we needed to regroup- and that meant we needed to find a Wal-Mart. Say what you want about Wal-Mart, but when you’re there, you’re home. There’s something comforting about that big open space, the down-home elderly door greeter, and aisles virtually indistinguishable from those at home. We had counted on finding a wireless network somewhere so I could use my laptop to get our bearings. But the motel we stayed in barely had electricity, let alone an Internet connection. I called Rhonda and asked her to guide us to a Wal-Mart, where we stocked up on water, maps, diapers, and snacks. After the night we had, those yellow smiley faces were indeed a welcome sight. I think a person could almost live at Wal-Mart. I once read a story about a kid who actually did for a while. For a high school class experiment, he set out to see if Wal-Mart could provide all living essentials. He spent spring break at his local supercenter, dining on McDonald’s fries and sleeping on patio furniture in the garden center. We had no need to stay that long. After all, this was the first official day of our great Gulf Coast adventure. With some directions from Rhonda, we drove to two cemeteries along Highway 190. As we pulled into the drive I got my first taste of Katrina’s wrath. For an outsider, seeing Louisiana’s above-ground tombs for the first time is shocking enough. But these particular tombs were not only above ground- they were cracked open, tipped over, and scattered. I hopped out of the car in my shorts and flip-flops and was immediately assaulted by an army of biting ants. I should take a moment to mention that bugs love me- especially southern bugs. I don’t know what it is about me that appeals so much to them. But I can hardly take a step outside before I’m eaten alive by something. It’s almost like the little fiends just wait for me to walk out a door. As the ants began tearing into my right foot, I scrambled back to the car to scrape them off and put on socks and shoes before setting out again into the heavily-wooded graveyards. Much of New Orleans lies one to ten feet below sea level and the Slidell area isn’t much higher. The high water table in this region is the main reason for the above-ground cemeteries, which are often referred to as “cities of the dead.” Early settlers found themselves in a macabre dilemma when it came to burials. They had to dig shallow graves because of the high water table, which would rise after rainstorms and pop the airtight coffins out of the ground. Bodies floating around after rainstorms was a common occurrence. When weighing coffins with heavy rocks and boring holes in the caskets failed to keep the deceased at rest, above-ground tombs were the solution. Southern Louisiana cemeteries are like mini cities- little Main Streets lined with sun-bleached facades in various stages of decay. It’s an almost overwhelming scene. Grandiose New Orleans cemeteries are the stuff of legend, but these two Slidell graveyards were small and humble. No doubt this was a very peaceful place until just over a year ago. Now it looked like something out of a horror movie. This entire area flooded during Katrina. A good portion of Slidell was literally washed away. The floods respected nobody- not even the dead. Local newspapers recounted reports of multiple dislodged coffins in Slidell cemeteries, some revealing visible human remains. One body floated into a man’s front yard. In these cases the coroner’s office acted promptly, removing the remains to a makeshift morgue. Many bodies were never found. Lacking the resources to move displaced coffins back to their original sites, the city left them right where they washed up, and they remain there to this day. It’s hard to believe that a several ton concrete vault can float. The scattered coffins were yet another testament to the unbridled power of nature. Some were upright but filled with water- no lid in sight. One was slightly tipped, its lid upside-down and halfway off. Another vault laid slightly open with a crushed wooden casket visible inside. Yet another lay several yards away in the marsh. Most of the shelf vaults were simply vacant. To say this was disturbing would be an understatement. These were not ancient tombs filled with unknown people of civilizations past. These were family cemeteries with many tombs only recently populated. I was grateful these coffins were empty and sad for the families unable to pay to put their loved ones back to rest. All photos by Bonneville Mariner. WE HADN’T PLANNED TO VISIT NEW ORLEANS. The spring prior, my wife and I had given up our seats on an overbooked United flight out of San Diego in exchange for two free tickets to anywhere in the Lower 48. I love being a landlocked desert rat, but it has its drawbacks. Specifically, the high desert lacks two very important things: palm trees and the sea. Sure, we have the Great Salt Lake. But there are no waves, no fish, and believe me- you don’t want to swim in it. This could be easily remedied though: Dike off a section of the lake, dilute it with fresh water until you hit ocean salinity, construct a couple faux coral reefs, and throw in some dolphins. Voile! Ocean! Take note, Utah Tourism Board- I’m giving you this idea for free. As a boy, I vowed to grow up and biologically engineer a palm tree that could thrive in Utah’s harsh bipolar climate. There’s just something about exotic evergreen leaves perched atop a thatched trunk that just plain makes me happy. Palm trees = tropical paradise. Tropical paradise = zero stress. Zero stress = happy. I realize this is a very simplistic train of thought that by no means reflects reality. But that’s how it works in my mind. When I’m driving south on I-15 and pass that invisible line, below which the beloved palm tree grows, my inner surf bum compels me to don flip-flops and blast Jack Johnson tunes. The decision on the tickets was a no-brainer- we’re going somewhere with palm trees and salt water. Since airline tickets don’t come easily for us, we decided to kill two birds with one stone. A nice jaunt to Pensacola, Florida, would satisfy my beach craving and we’d be able to see a corner of the Deep South. It turns out United doesn’t fly to Pensacola. But they do fly to New Orleans, and a drive along the Gulf Coast sounded nice. We arranged to leave our two oldest kids with family, but the one-year-old was going with us, frankly because he’s nuts. Not mental nuts- maniac nuts. Tasmanian devil nuts. He’ll have a room in shambles before you even notice he’s crawled off. When my mom watches him, she knows to take the knobs off the stove and lock up the cat’s litter. From what we’d seen in the media about the Big not-so-Easy post Katrina, we were worried about taking our baby there. But we were more worried about the boy burning down mom’s house. So we bought a snazzy baby backpack at the baby store were on our way. I’ve always been interested in the South, partly because it’s so different from Utah, but mostly because it seems to me that a great deal of American culture originates there. Each region of the United States contributes in its own way to the collective American experience. But the South makes a special contribution. A rich history fused with a unique landscape has produced an area lush in character that bleeds deep into the American psyche. Of course there are the tangibles- the food, tradition, architecture, music. With those, the South has certainly made its mark. But there is also a profound, non-corporeal component, for which those tangibles merely act as a vehicle. It is that component which interests me the most. In short, the South is the soul of this nation- America’s cultural heartland. I got my first taste of the South when I met my wife and spent some time in Texas. Some argue that Texas is more West than South. To me, eastern Texas is much more South than West. Driving through the green-draped corridors of east Texas, I might as well be driving through central Alabama. My wife is definitely more southern belle than cowgirl. My friends on the Gulf Coast would argue that the Deep South is much different from the Appalachian South. My friends in the Appalachian South would no doubt agree. Scroll down or click here for part 1 of this series. I REMEMBER WATCHING AN OLD EPISODE OF THE TWILIGHT ZONE late at night when I was a kid, where a man wakes up alone in the world. The city is still there- cars parked along streets, papers blowing in the wind- but there’s no sign of any other living person. I remember thinking how eerie that must have felt. Last fall I was that man. Walking alone along a street with no name in the city that time forgot. A street paved with black sludge, littered with abandoned cars, fallen trees, and stairways leading to nowhere. It had been a full year since the flood waters receded, leaving piles of bricks and waterlogged timber. It might as well have been yesterday. My wife stops the car and I get out to look around. As she drives on, I realize the the only detectable sound is the car’s engine. She’s just as interested as I am, but our baby is sleeping in the back seat, and from the looks, smells, and feel of this place, she is happy to explore the area behind the wheel of our air-conditioned rental car. We’re in the famed Ninth Ward- the New Orleans neighborhood that made a name for itself long before Hurricane Katrina. The region lies east of the French Quarter between the Mississippi River and Lake Ponchartrain, and is bisected by the Industrial Canal. Katrina made its second landfall in southeast Louisiana as a category 3 storm on August 29, 2005. The first levee breach at the Industrial Canal occurred at 9:00 am that morning, sending floodwaters spilling into this low-lying neighborhood. Another floodwall breach near North Johnson Street stripped houses from their foundations, leaving a wake of clamshell-speckled silt. The floodwall is rebuilt but the silt trail remains. I pick up a clamshell and put it in my pocket. This is where I begin my walk through the Lower Nine. I pass a house whose exterior walls are gone but the interior ones still stand. There are children’s drawings and a portrait of Jesus hanging on one of the walls. I climb up a pile of rubble to get a closer look, but the boards break under my feet and I jump down as I start to fall through. Walking along the remains of Derbigny Street, I stop to look at a rusty child’s wagon and a bunch of cassette tapes scattered in what used to be somebody’s front yard. The silence is awkward and I am consumed with emotions that range from awe to sadness. Houses that still stand bare common marks- spray-painted symbols on the doors and holes in the roofs. Signs scrawled out in marker or spray painted on any surface available reveal the desperation of a people trapped in their own neighborhoods, most with no food or water. That desperation lingers here still, long after the waters receded and the people disappeared. I’ve never been here before, so there’s no way for me to realize what has been lost. And yet I feel a profound sense of loss as I survey endless miles of utter destruction. I remember all the footage from last fall. I remember the Superdome, waves of desperate people making their way to higher ground, flooded streets, floating bodies. The storm came and went, and the nation watched as the levees broke and Crescent City drowned. Those who had boats or rafts gathered their loved ones and paddled toward the French Quarter. Some swam, some floated on mattresses. Those who couldn’t get out went up, first into their attics, then onto their roofs. Those that were rescued in the days following the flood were shipped en mass to places like Houston and Salt Lake City. Now the famous neighborhood with a very loud history is still, the silence broken only by cicada song and the occasional rumble of a National Guard Hummer. This is my first trip to the Deep South. And it is one I won’t soon forget.